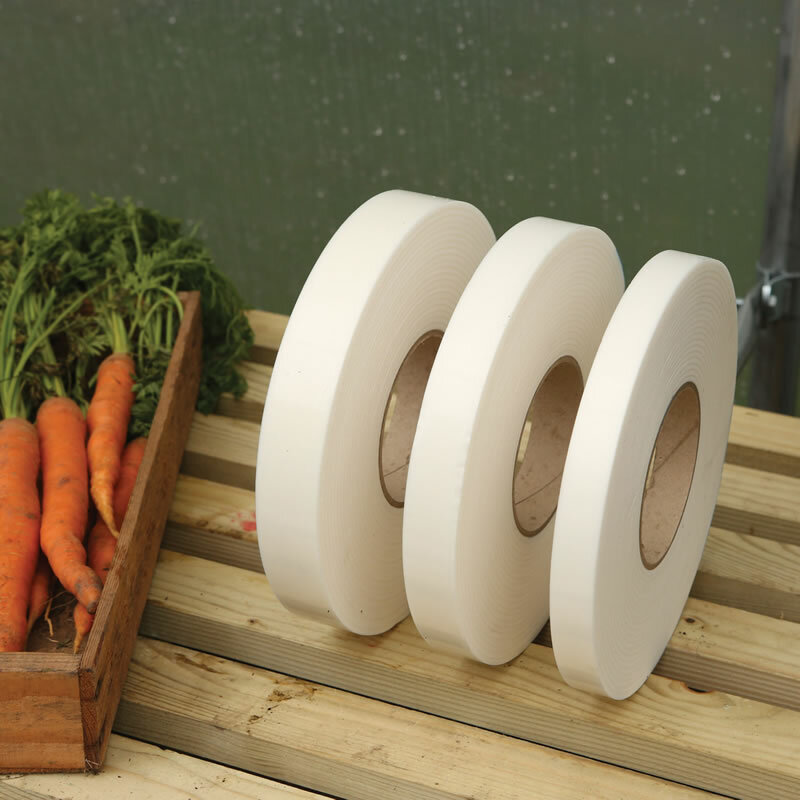 A self adhesive foam tape which when placed over Polytunnel hoops prolongs the life of the polythene by at least one year. Protects the polythene cover against hot spots preventing heat degradation. The slippery surface allows the cover to glide over the frame preventing abrasion and snagging of the cover during construction. First Tunnels always uses Anti Hot Spot Tape when constructing polytunnels. Three widths available - 20mm, 25mm & 30mm, 9 metres on each roll. Rated 4.8 out of 5 based on 96 reviews. Good quality product. Stuck down straight away. Easy to use. This was easy to apply to the frame and stuck down around the curves of the tubes successfully. It was easy to pull the cover over the frame with it in place. A good product. Easy to apply. No problems so far. Seemed to have no adhesive layer. Does the job and lasts for years! Bought 5 rolls of this and it completed my 6ft 6inch by 13ft 6inch poly tunnel frame. Very happy with the product. Good quality tape. Easy to apply and seems to stick well. Excellent adhesion. Good cushioning and the glossy surface helped the cover slide along the frame ridge at the beginning of the covering procedure. Seems to be a great job but ordered far too much. Might be worth offering the correct amount inclusive and then reduce the price accordingly for those who don’t take your advice. it's tape...what can I say. Average quality ,well packaged and promptly delivered. i only ordered 2 rolls and although we managed 3 rolls would have been better. Just like the other roll does what it says on the tin. Good quality tape, stuck really well to the hoops and other metal fixings. I use the wide material to cover the original narrow material supplied with the original kit. Surprisingly the original material was still in good condition. Does what it needs to. Easy to use. Worked well as expected & did the job it was designed for. Has worked well for 7 years, but now needs replacing. Extremely sticky and did the job. Other tapes I have used over the years very pretty useless. Not used it yet but quick efficient service. Good quality product, have used this before. Exactly as described and works! Excellent quality, does the job arrived on time no problems , have used before and will use again can highly recommend. Waiting for the weather to be good to me so I can get this in place. Certainly seems to be great quality. Nice product, very easy to apply onto the metal. Quality product with good adhesion to tunnel frame. No problems to apply this. Easy to use product and made easy to select with the skills of the sales team... off the shelf too! The product does what it is meant to. Easy to use, this tape is recommended to help prolong the life of your tunnel cover as it reduces the contact with the tunnel frame, it was inexpensive so I thought it well worth the extra couple of pounds. Easy to fit and it helps the plastic slide over the frame. I would get this again next time. Worth the extra money and really helped with easing film over supports. Just bought some more to protect polythene on a couple of hot spot areas. Works well. Nice wide tape so no chance of meltdown! Somewhat weak, tends to tear as you pull it tight over the bars. You need it to go on the hoops to protect the plastic from the heat of the metal. This product qualifies for reduced postage on a maximum of two rolls, if your order exceeds two rolls, and is less than £50, shipping costs will be £4.95. For orders above £50.00, delivery is FREE. This applies to customers in the Blue and Red area. For customers in the Orange ares, the delivery charge will be £30 irrespective of your order value, for small orders please call us on 01282 601253.